Spice mixes can be expensive and it’s not always easy to make sure they are fresh. With these easy spice mix recipes you can have fresh inexpensive spice blends on hand at any time. I call this a list of ‘spice mixes’, but many, like the French ‘fines herbes’, are a mix of herbs or herbs and spices. These are my favorite mixtures and the ones I turn to most often in my own kitchen. I hope you like them. Garam masala is a popular mixture of ground spices used extensively in Indian cooking. It is available ready-made but if you cannot get it, you can easily make it yourself. Just very the amounts of the ingredients according to your personal taste. Heat a heavy – base frying pan over medium heat. Add the cardamom seeds, cumin seeds, coriander seeds, peppercorns, cloves and the cinnamon stick (omit the nutmeg for now). Stir constantly until evenly browned. Remove the spices from the pan and allow the mixture to cool. Once it is cool, grind the roasted spices and nutmeg to make a fine powder. Of course you can buy curry powder in any supermarket. However making your own is quite easy and adds a very special taste to any dish. Place cumin seeds, fenugreek seeds, mustard seeds, peppercorns, coriander seeds, ginger, chili powder and turmeric in a blender or coffee grinder and grind to a fine powder. Store in an airtight container. Place ginger, turmeric, cloves, garlic, coriander, mint, cardamom and vinegar in a food processor or blender and process until well combined. Heat peanut and sesame oils in a small saucepan, stir in spice mixture. Bring it to a boil. Once it comes to a boil, remove it from heat and allow the mix to cool. Store in an airtight container. I would store this mixture in the refrigerator. Place the chilies, onion, garlic, oil, lemon juice, cumin, paprika, turmeric and pepper in a food processor or blender and process until well combined. Five spice powder (it’s the one in the picture above) is a favorite ingredient in Chinese cooking. One of the main ingredients is anise, which adds a light licorice flavor Asian dishes. Of course in Chinese home cooking, cooks make their own Five spice powder mixtures so no two recipes are ever exactly the same. Try this recipe for 5 spice powder and see how you like it. 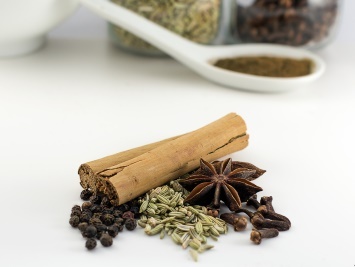 By making your own five spice powder you are able to alter the ingredients to suit your personal taste. Place anise pepper, star anise, cinnamon, cloves and fennel seeds in a blender or coffee grinder and grind to a fine powder. Store the spice mix in an airtight container for up to three months for the utmost in freshness. I add this spice mix to any stir fry. It is perfect in a chicken and vegetable stir fry, but works well with vegetarian recipes as well. 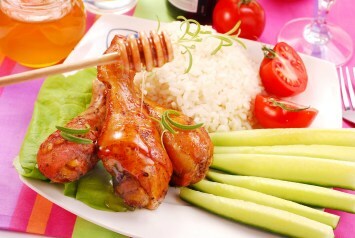 5 spice powder is also delicious sprinkled on a whole chicken or chicken pieces before roasting. Because the spice mixture gives the meat an Asian flavor I would serve the chicken with rice and Asian inspired vegetables. Fines herbs is a mixture of fresh chopped herbs used by French cooks to add flavor to everything from meat dishes to omelettes. The following spice mix recipe is the traditional combination, but you can vary it depending on what you flavors you prefer and where you want to use it. For example, I am not a big fan of tarragon, so I would use less and let some of the other herbs shine. Combine parsley, chervil, chives and tarragon and use as required. As with most of these spice mixes, a little of this mixture goes a long way. Use this French fines herbes mixture to flavor cream sauces, meat dishes, sautéed vegetables or omelettes. A bouquet garni is the French term for a small bunch of herbs and spices which is used to add flavor to a dish, in particular casseroles and soups. Bouquet garni is available ready-made, however, It is easy to make and the flavor is superior. Use the following recipe to make a basic bouquet garni and try some of the other variations for a change. Place herbs stems together and tie with string. If using dried herbs, place 1 teaspoon dried parsley, half teaspoon dried thyme and a small crumbled bay leaf on a piece of muslin, bring the corners together and tie with a piece of string. When making chicken stock, use lemon thyme in place of thyme and tie a strip of lemon rind into the bouquet garni. When making beef stock, tie a strip of orange rind and if you celery leaves into the bouquet garni. There is another recipe for bouquet garni on the site here. It’s a bit different. As I said, there are many ways to make any of these spice mix recipes. Another French herb mixture, this one a little different from the Fines Herbes. This one is Martha Stewart’s version. Combine all the herbs and store them in a jar with a tight fitting lid. Great on salmon or chicken. All of these recipes make more than you need for one recipe. For the dry mixes, place the finished mix in a glass jar with a tight fitting lid. They all keep for at least 6 months in your kitchen cupboard. The wet mixes, as you can see above after the recipe, should be kept in the refrigerator so the oil doesn’t go rancid quickly. With all of these herb and spice mixes my most important piece of advice is this: Try a bit in your recipe first and see how much of it you want in your food. It’s easier to add more to zip it up a bit, than to try to compensate for over flavoring a dish. Use these Indian spice mixes to flavor some of these amazing recipes.